The Scottish Borders rarely gets a decent mention in travel guides to Britain, but it should – it has beautiful countryside, brilliant sport including hunting, shooting and fishing, and it’s much easier to reach than far-flung parts of the Highlands. Unfortunately, unless you’re staying with friends, the amenities can leave much to be desired, and as holidaymakers become more demanding than ever, a paucity of good hotels can mean even the most amazing locations can be overlooked. 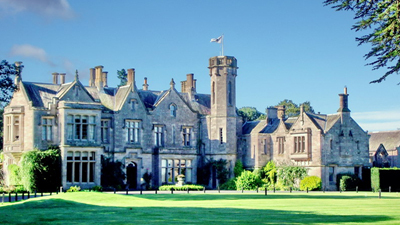 Happily just before Christmas I found one hotel bucking this trend for lacklustre accommodation in the Borders: The Roxburghe. An independent hotel owned and run by the Duke of Roxburghe, and situated on the banks of the River Teviot on his estate near his country seat Floors Castle, it is ideally situated for those who love outdoor pursuits. The golf course is extremely well-regarded, in an area which is not short of good golfing opportunities, while the fishing and shooting are run by legends in their fields. The Estate boasts some of Scotland’s best salmon fishing with a wide range of fishing options including two much sought after beats on the River Tweed; Upper and Lower Floors. Or you can try your hand at fly-fishing at their Fly Fishing Centre of Excellence The Estate also offers shooting for pheasant, partridge and grouse and if you have no previous experience you can always have a lesson with clays. For those who prefer to explore on two wheels, or four legs, the hotel can organise mountain biking, or horse-riding (treks or lessons) in the area. Within easy reach are some of the best bits of the Borders, from Floors Castle to the ruins of the old town of , to Kelso itself with its charming cobbled market square. As a background to all this activity, it’s important to mention how lovely the hotel is to fall back into after a long day in the great outdoors, although you don’t have to spend all day casting into the wind to appreciate its most welcoming feel. 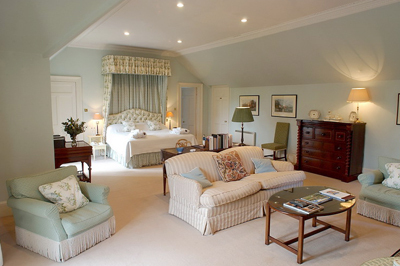 With a great history, this old hunting lodge stands proud in all its Victorian splendour, and offers just 22 rooms, most of which have been interior designed by the Duchess herself. All the rooms are characterful and range from twins and doubles to much larger suites in the main house, and the courtyard rooms (dogs welcome) are just a few hundred metres in the former outbuildings. Some are classic, some more modern; some have their own log fires and most have wonderful views. Returning guests all have their favourites, and tend to re-book before they leave to make sure they get the one they love most. The public rooms are warm and friendly – winter is always the best time to visit these hotels, I always think – and a log fire greets guests in the reception hall in winter, and another in the cosy library. The dining room, library bar and conservatory provide choices for pre-and-post dinner drinks or games and the décor is classic Scottish Victorian, complete with requisite tartan carpets. Whether or not your party has been active during the day, the food is beautifully put together, and there is plenty of it. Menus are twists on classic dishes using local ingredients and during a beautiful brunch, dinner and breakfast the following day our food was consistently delicious, and catered for hearty full English Breakfast types as well as those sticking to healthy New Year’s resolutions. Likewise, there are enough shared spaces for one party to stay up until the wee small hours swapping stories and sampling the whisky menu, while in another room a different party enjoys a quiet game of backgammon before an early night. The service is impeccable and naturally charming. Too often in country house the grandfather clock ticks over whispering couples and makes one feel uncomfortable but here both staff and guests were cheerful and nothing was too much trouble. Being owned and run by a very hands-on Duke also gives the property an authentic feel as a real part of the estate, in contrast to hotels which are a world away from their original private houses. Testimony to the success of the Roxburghe is their retention rate: people travel back here from all over the country regularly. And why not? It’s a brilliantly run, genuine, unpretentious hotel which could teach many country houses now in hotel-group ownership a thing or two about doing things properly.